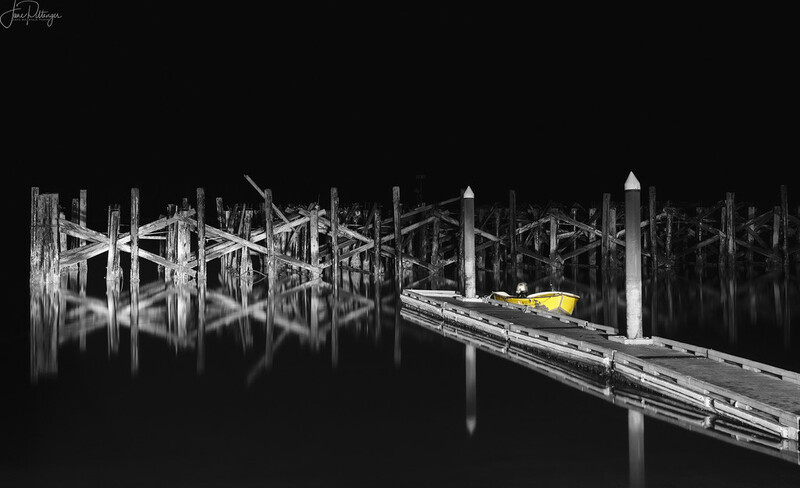 I loved the reflections and structure of the broken down pier in the background and liked how the yellow boats adds a story to the night image. Best as almost always on black. Fantastic image, mysterious as to who is running off in a quick get away. Great capture. Really like the lighting and B/W with the splash of yellow. Wow - I love this photo - it is just stunning- and that tiny spot of yellow is perfect. Lovely - and the pop of yellow adds extra interest. Love that pop of colour! That composition is so wonderful -- the structures, the line, the yellow boat, and then the blackness all around. Wonderfully atmospheric as well as inviting. Really striking! Love the B/W with the pop of yellow. Great composition and pop colour. Always some mystery Jane. Maybe there is a mermaid in the deep. Oh WOW this is a beauty and is stunning on black!